A hard day? Tired and frustrated? Maybe you are in the middle of a project that has just taken a turn for the worse. Well you are in luck my friend. Because if this recipe doesn’t cheer you up, you might need to check for a pulse. The smell of Banana Bread baking in the oven seems to help troubles just a little more manageable. One small bite at a time. Put it this way, do you think Starbucks would waste space in their bakery cupboard for something that wasn’t a huge hit with their customers? The answer is NO. Some of their baked goods are standard such as blueberry scones, filled croissants and banana bread. You know what I think appeals to people? It is naturally sweetened by fruit and everyone knows someone who baked this. Whether it is a mom. 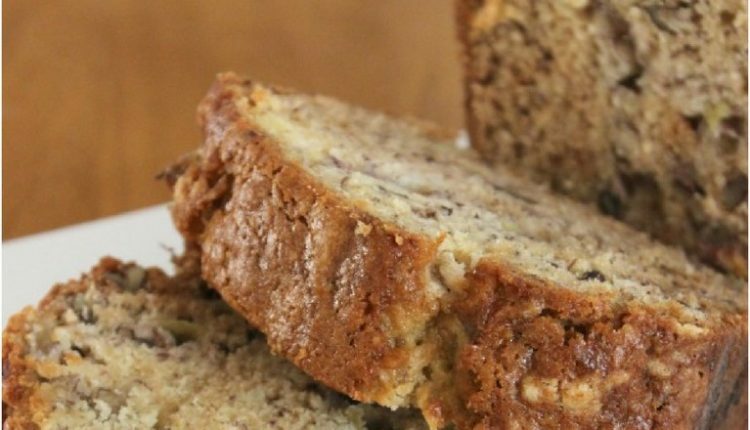 A grandma, or a favorite next door neighbor, the aroma of freshly baked banana bread just says, come in, share your soul, and stay for a slice. Because Starbucks knows that this goes with a great cup of coffee, this copy-cat recipe is extra moist, but don’t take my word for it. Bake a loaf and see for yourself. Or better yet, bake two loaves and share with someone who could use a bit of a lift. This is what Charlene of My Frugal Adventures has to say about her favorite quick bread. Quick Tip: You can add chocolate chips instead of walnuts, or better yet, add both.